Springfield, Missouri, May 22, 2017. Announcing the publication of Inventing Lincoln: Approaches to His Rhetoric. Pp. xiii, 372, notes, index. Paper. This book does not develop a new, provocative interpretation of Abraham Lincoln—as some readers might require to justify a new Lincoln book—but it does pursue a purpose that none of the other 15,000+ books in Lincoln studies have ever attempted. This book provides a systematic discussion of the work of selected biographers and several kinds of scholars who have invented Lincoln through their explanations and judgments of his discourse. Inventing Lincoln reveals the rhetorical concepts and analytical methods applied by Lincolnists to his discourse and in turn the rhetorical qualities they perceive in his speeches and other writings. Such an account of approaches to Lincoln’s rhetoric strengthens our understanding of the relationship between his compositions and his public life, and facilitates more meaningful reading of his texts by the educated public, instructors, and advanced students, who may gain ideas for further research. 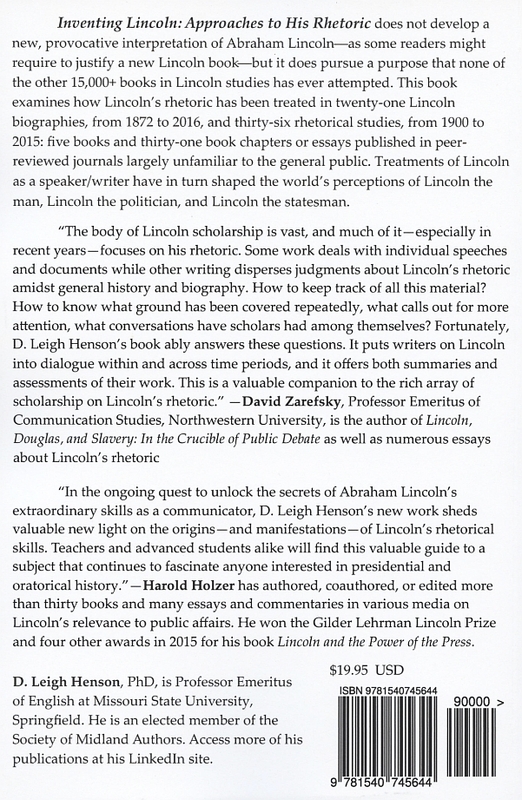 In researching and writing this book, Henson sought, received, and used suggestions from prominent Lincoln scholars. Applying fundamentals from classical rhetoric, Henson explains and critiques how Lincoln’s speeches and other compositions have been treated in biographies—twenty-one, from 1872 to 2016—and studies of discourse analysis—thirty-six, from 1900 to 2015: five books and thirty-one book chapters or essays published in peer-reviewed journals largely unfamiliar to the general public. Lincoln biographers and academics' fields of expertise, values, and beliefs affect the choice of his speeches and other compositions they write about--and every aspect of treating them: contextualizing, analyzing, summarizing, explicating, quoting, paraphrasing, and assessing. In effect, all techniques of rendering the meaning of a text and judging it are interpretive. Through their various approaches to Lincoln's discourse, his interpreters are immensely responsible for inventing him--shaping the world’s beliefs about Lincoln the man, Lincoln the politician, and Lincoln the statesman. Inventing Lincoln is a discursive, bibliographical exposition emphasizing how Lincoln experts have or have not explained growth and development vs. consistency in his rhetoric, and its eloquence vs. demagoguery. This book rigorously critiques sources that claim Lincoln was a demagogue. Surprisingly, Henson finds that despite many Lincoln experts' observations about his eloquence, a comprehensive study/definition of it has yet to appear. The final section of this book recommends strategies to advance scholarship on Lincoln’s eloquence, among other aspects of his discourse. This book is intended for multiple audiences, including instructors and advanced students in English and cultural studies (for example, literature and language), rhetoric and speech communication, history, political science. and presidential studies. Specialists in these fields will find new information and fresh analyses of familiar information. This book features abundant endnotes (citing primary and secondary sources, including many of interest for additional reading) and an index that includes rhetorical and literary terminology. All readers of this book, including Lincoln buffs and history buffs in the general public, will find clarity in this scholarship: the book has a Flesch-Kincaid grade-level reading score of 15.6 (undergraduate senior). To gain a better understanding of this book, access a PDF of the title page, copyright page, dedication page, table of contents, acknowledgments, preface, introduction, endnotes to the preface and introduction, and index. The PDF presents actual pages from the book. The generic web PDF reader allows viewing only one page at a time, unlike such other PDF viewers as Adobe Reader, which allows two-page viewing as with opening an actual book. In a generic web PDF reader, the margin sizes alternate from page to page because of the need for extra space in the center (gutter) of the two-page layout view. Also, blank pages in the PDF accommodate the conventional feature of printed books that new sections/chapters begin on odd-numbered pages. The preface explains the book's purpose, scope, and methodology. The introduction provides background information about rhetoric as a field of study as well as about the questions of Lincoln's rhetorical education, his rhetorical growth and development vs. consistency, and his eloquence vs. demagoguery. 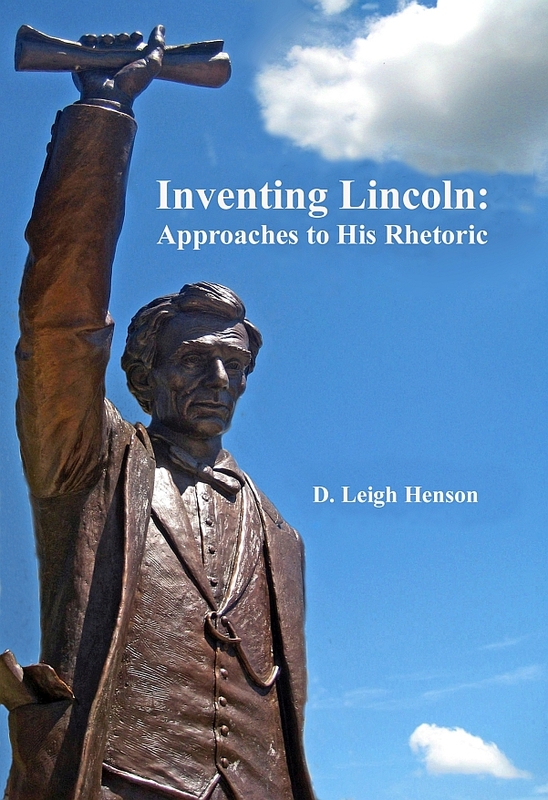 Order Inventing Lincoln at https://www.amazon.com/Inventing-Lincoln-Approaches-His-Rhetoric/dp/1540745643. 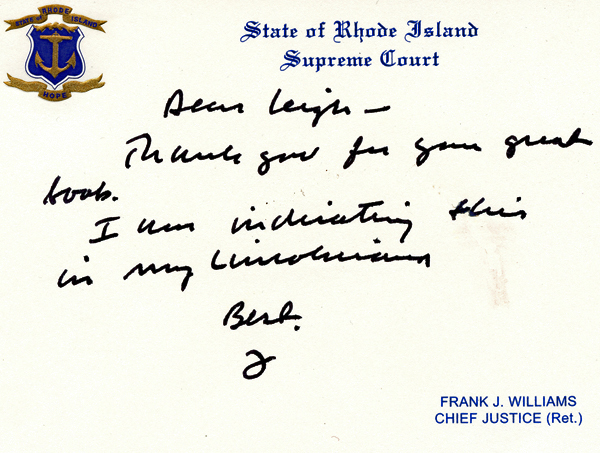 The image below shows the thank-you note Henson received from Frank J. Williams after he requested and received a copy of Inventing Lincoln. Retired Chief Justice Williams is a leading Lincoln authority and Lincoln collector. In 2011, Williams requested and received a copy of Henson's book titled The Town Abraham Lincoln Warned: The Living Heritage of Lincoln, Illinois; see link at the bottom of this page. In the early summer of 2017, Frank J. Williams and his wife, Virginia, announced they were donating their vast collection of Civil War and Lincoln material, including "books published over a span of 150 years," to the library of Mississippi State University: http://www.msstate.edu/newsroom/article/2017/06/frank-and-virginia-williams-rhode-island-gift-extraordinary-lincoln-and/. A native of Lincoln, Illinois—the First Lincoln Namesake Town—D. Leigh Henson spent his college freshman year at Lincoln College—the First Lincoln Namesake College. He earned a bachelor’s, master’s, and PhD in English studies at Illinois State University, whose original attorney was Abraham Lincoln. In 1990 Henson cofounded Technical Publication Associates, Inc. In 1994 he retired from teaching high school English for thirty years at Pekin, Illinois. 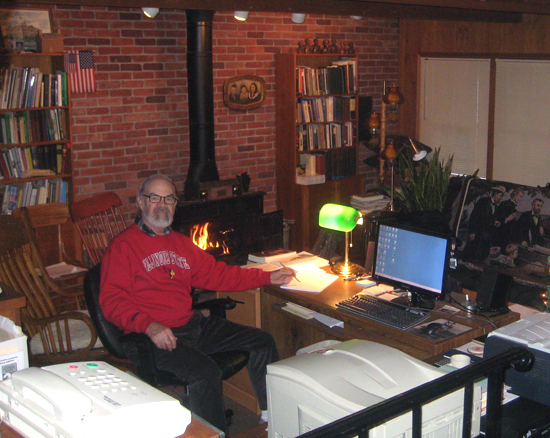 Since 2008 he has been professor emeritus of English at Missouri State University, Springfield, where for fourteen years he taught and published on the theory, practice, and pedagogy of technical and marketing communication. He has also published articles in peer-reviewed journals related to rhetoric and composition, and the pedagogy of literature. His book The Town Abraham Lincoln Warned: The Living Namesake Heritage of Lincoln, Illinois, and his collaborative, community history website of his hometown received Superior Achievement awards from the Illinois State Historical Society. He has published on William Maxwell's portrayal of social classes and Abraham Lincoln’s political activity in the Journal of the Illinois State Historical Society and on Lincoln’s rhetoric in the Journal of the Abraham Lincoln Association. Henson is a member of the Illinois Center for the book: http://www.illinoisauthors.org/cgi-bin/illinoisAuthors/getSpecificAuthor.pl?uid=7633. He is also an elected member of the Society of Midland Authors: http://www.midlandauthors.com/index.htm. Email comments or questions to DLHenson@MissouriState.edu. Connect with him at https://www.facebook.com/leigh.henson and https://la.linkedin.com/in/d-leigh-henson-9231a516. with links to his cv and to his other publications on Mr. Lincoln's history, heritage, and lore of central Illinois, and on Lincoln's rhetoric: http://findinglincolnillinois.com. Webpage about the author's award-winning book The Town Abraham Lincoln Warned: The Living Namesake Heritage of Lincoln, Illinois: http://findinglincolnillinois.com/townabewarned.html.